We’re building an application to gather and compare performance metrics of various laptop configurations in given set of benchmarks. As such we’re going to start with certain set of entities, first of which will be the User. We’ll start off by defining our User entity, configuring ActiveRecord, and some basic tests. First thing’s first – we need to get ourselves a fresh version of required libraries. At this point in time I’m using the trunk version. You can get the latest binaries here. Everything I show here will work with ActiveRecord 2.1 final version though. We need Castle.ActiveRecord.dll, Castle.ActiveRecord.Linq.dll, which is where integration with NHibernate.Linq lives, and NHibernate.dll. Having that in place we can start coding our first entity. We mark our class with ActiveRecordAttribute. By doing this we let Active Record know that this class is persistent. We use ActiveRecordLinqBase<User> as our base class. This gives us access to all standard Active Record pattern methods, as well as IQueryable<User> so that we can use LINQ to query for our users. Alternatively if we didn’t want to have this base class we can use ActiveRecordMediator<User> which provides the same persistence services as our base class. Now, that we told ActiveRecord it should persist our User class, we’ll need a primary key property. Couple of things to notice about this piece of code. We use PrimaryKeyAttribute to mark our property as holding primary key. Also we use Guid as our surrogate primary key type, for several reasons. If you’ve used older versions of ActiveRecord, you may notice I didn’t specify primary key generator kind. ActiveRecord 2.1 will infer it from property type and will use guid.comb. We also don’t expose setter for this property. By using PropertyAcess.NosetterCamelcase we tell ActiveRecord to use getter to retrieve value of this property, and to use backing field which has identical name as the property, but written in camel case to write it. We use PropertyAttribute to mark properties that should be persisted. While we don’t put any non default constraints on the Email property at this point, we’ll make user name unique, and we’ll disallow nulls. For password we expose only setter. Also since we don’t want to store passwords of our users, we hash it, and store the hash. About is a property that has Length set to 10000. This means nvarchar(max) for SQL Server 2005 (which is what we’ll use) or corresponding data type if you use other database engine. Let’s set up a test project for ourselves and start writing some basic logic. But before we do this, we’ll need to set up a database and configure ActiveRecord. For our database we’ll use SQL Server .mdf file. When we create it, we’ need to create an AppDomain configuration file and put some basic configuration in it. We could alternatively put ActiveRecord configuration in some other file it we wanted. We start by declaring active record section and registering handler for it. We then put standard Active Record configuration. We tell it to pluralizeTableNames, so that for our User class a Users table will be created. We then specify what kind of database engine we want to use (MsSqlServer2005) and name of the connection string to use. That’s it. If you’ve used previous versions of ActiveRecord you may remember it used to require quite a bit more configuration. Now it will just use default values for these, which you can always override if you want. We can now move on to creating tests. We’ll use XUnit.NET as our testing framework. Sine ActiveRecord is built on top of NHibernate we also use NHProf to gain insight into what’s going on under the cover. Here’s the setup code. ActiveRecordStarter.Initialize reads all settings from the app.config file we discussed above and initializes its engine. We then feed it with information about our Active Record classes, and call UpdateSchema. ActiveRecord will now generate our complete database schema for us. As you can see table name is nicely pluralized, and all the information we specified in attributes was used to create correct schema. Having that, we can now create our first test. About = "Stefan is a very cool." We create a user, than call method Save, inherited from our base class which persists the user to the database. 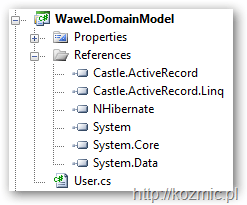 We then can use static Queryable property which exposes LINQ engine to create a fancy LINQ query to retrieve our user. Fantastic! We have a working persistent user entity! This entry was posted in ActiveRecord, Castle. Bookmark the permalink.